Barnbaum v Thornton: who's right? Pre-flashing or pre-exposing a negative to improve shadow detail in contrasty scenes was a technique advocated by the late Barry Thornton in his book, Elements. I've used this approach with paper negatives in a bid to tame the high contrast they tend to produce. However, I've never actually done any testing to see what effect it has and, since I've used it in conjunction with a yellow filter on the camera (again, it helps to reduce contrast with paper negs ) and weak developer (ditto), I can't say how effective it's been. I ended up with manageable paper negs but how much each of the lower contrast measures I used contributed to the end result is, to me, unknown. Film has a slight inertia to light in that little density is recorded when the first photons hit the emulsion. It takes a certain amount of light to cross a threshold at which point tones start to be recorded. Sometimes with dark shadows this threshold is never reached so no densities are recorded in these areas. The idea with pre-flashing is that the film is exposed to just enough non-image forming light before the actual exposure takes place in order that this threshold is reached. Thereafter, dark shadow tones should show up on the film after development. Looking through some photography books in my darkroom on Tuesday, I opened Bruce Barnbaum's The Art of Photography at a chapter where he describes pre-flashing as a waste of time for negative material. He says photographers who advocate pre-flashing are just plain wrong - and he includes Ansel Adams in that group. Now, I've always thought of Barry Thornton as a very good technician and find that he has a lot of interesting and useful things to say on the subjects of film and darkroom work. I know a good deal less about Bruce Barnbaum although, just on the evidence of their respective books, I'd have to say that he appears to be a "better" photographer than Barry. The production quality of Bruce's book is pretty poor, though, resulting in washed-out looking photographs on thin paper that shows the text on the other side of the page and a soft cover that is so lacking in structural integrity that the book flops around like a soggy pizza. Bruce's explanation for his forthright opinion on pre-exposure makes sense and yet it hardly seems likely that the likes of Barry Thornton and Ansel Adams would have used and advised this technique without carefully testing the process to death. So who to believe? The principle is simple and I use it a great deal. A facility to double expose is necessary if the ﬂash is done in camera, and it gets difficult if you don't. A pre-exposure of ‘plain’ non-focused image light is given to the film at the level, usually, of zone I; then the actual image is exposed on the same piece of film. In practice, a piece of opal glass or plastic is needed - I use the filter-screwed end of a slide copier attachment. I place it over the meter and take a reading in the same direction as the camera's lens is pointing. This gives a zone V reading. By reducing this by four stops we arrive at a zone I exposure. I then place the opal filter over the camera lens and give the film this exposure through the filter which prevents any sharp image on the film. I then double expose the real picture on to the same film taking spot readings and setting zone system exposures as normal. Each zone of exposure receives one stop more, or double the amount, of light than the one before. So if we say that zone I receives one ’unit’ of light, then zone II receives 2, zone III 4 and so on in the progression 8, 16, 32, 64, 128 etc. If we pre-flash at zone I, we add another ’unit’ to each of these and the progression becomes 2 at zone I, 3 at zone II, 5 at zone III, then so on through 9, 17, 33, 65, 129, etc. So at higher zones the addition is imperceptible, but zone I becomes the density of zone II, and zone II achieves a 50% increase in density. It really does work and shadow detail and contrast is (sic) much improved. The ﬂash does not need to be as high as zone I for some effect. Alternatively a ﬂash as high as Zone II can be given to really drop contrast. The film speed does alter because we are pushing the film up to or beyond its exposure inertia point, and tests are crucial for pre-visualised results. Pre-exposure of ﬁlm is the procedure of putting a small amount of blank exposure on the ﬁlm, either before or after the actual exposure, to yield greater density in the shadow areas of the final print. Some well-intentioned practitioners advocate the use of this technique. In large part, they are wrong. 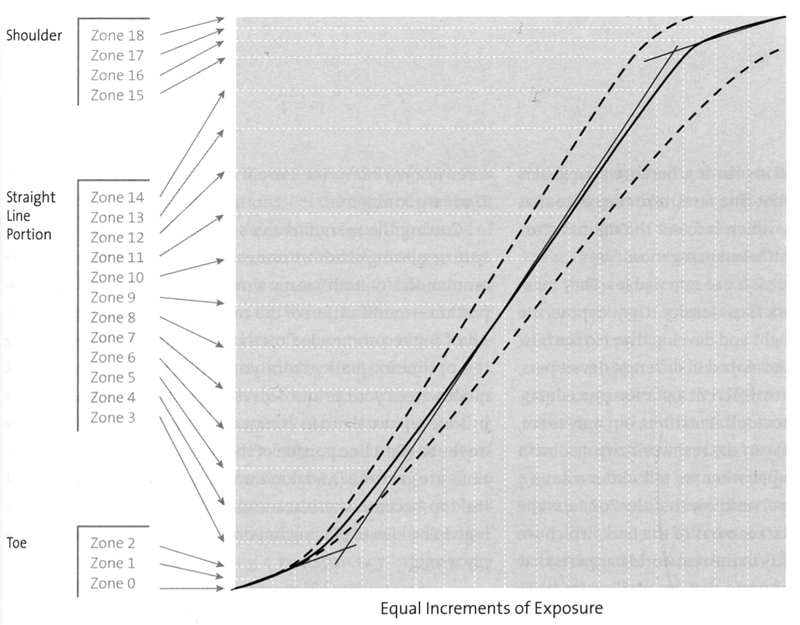 Diagram 9.5: The exposure/density curve. But while you have raised the density of the negative, you have not increased the separations, i.e., the angle of the toe of the curve. In other words, all you're doing is pushing the toe of the curve a little higher on the density scale. Creating greater density without creating greater separations is of no value in the ﬁnal print. The problem on the toe of the curve is not lack of density; the real problem is lack of separations, which translates to a lack of tonal separations in the ﬁnal print. Pre-exposure works effectively for positive transparencies only, and the technique can be put to use in a very interesting way. In transparencies, the toe of the curve is already dead black (remember, three stops below Zone 5 is below Zone 2). So if you use pre-exposure to bring those extremely dark or black areas into visibility, they are already on the straight-line portion of the curve. Pre-exposing a transparency brings some dark areas into visibility with reasonable separations. In addition, since transparency ﬁlms are balanced for sunlight, shadows tend toward a blue cast. Pre-exposure to a warm color (red, orange, magenta, etc.) can neutralize the blue cast in shadow areas without materially altering the exposure or color balance in the mid-tones or highlights. Those who promote the beneﬁts of pre-exposure often demonstrate the effects by using Polaroid ﬁlm to instantly show the difference. But Polaroid prints are positive transparencies on paper! Therefore, the technique appears to be beneficial. Even Ansel Adams touted the procedure in one of his early basic photo books. Unfortunately, he was just as wrong as everyone else in his advocacy of pre-exposure for negatives. Pre-exposure involves giving the negative a first exposure to a uniform illumination placed on a low zone after which the normal exposure of the subject can be given. The pre-exposure serves to bring the entire negative up to the threshold, or moderately above, so that it is sensitized to very small additional levels of exposure. It will then retain detail in deep shadow values that would otherwise fall on or below the threshold and therefore not record. I know I have some very knowledgeable and experienced readers and was wondering if anyone has an opinion they'd care to share. Is anyone using pre-exposure and have you done any testing that supports the theory? Or have you tried it and found it makes no real difference? I'm inclined to side with Barry (and Ansel) on this one. Is it really possible that these guys advocated a procedure that they never adequately tested and used for years to little or no effect? There's a clever saying that in theory there should be no difference between theory and practice but in practice there is. So does theory or practice hold sway here? Ralph Lambrecht, in his "Way Beyond Monochrome" book, has a chapter on pre-flashing film. He recommends using a white-balance filter. I've tried it on occasion, but haven't really done any controlled testing. Difficult to disagree with either of them. I tried to test this a few months ago and found little difference when pre-flashing Zone Zero (i.e one stop below One) or Zone One. I'm inclined to think that, for the film that i used, the flashing needs to move the base exposure up beyond the very shallow slope of the toe, and into the straight-line portion. So Zone Two might be a minimum. I haven't tested for Zone Two yet. Of course, the method is only useful for shadows that are already on the edge of being recorded. There must be scenes (e.g: a cave interior in a picture of a sunlit beach) where the shadows lie much more than five stops below Zone Five. Flashing would then merely introduce a little background fog. I wonder if the improved contrast of modern lenses has any effect. An old uncoated lens might well have given some de facto flashing. Intentional flashing would have built on this and the total extra exposure might well have been more than intended. I'm not a chemist or physicist, but as far as I understand for a silver halide grain to start to turn into silver it needs two photons hitting nearly the same spot, in short succession. I think (I don't actually know) that each photon knocks out one electron, one per silver atom, and when two are gone those two silver atoms can get rid of the halogen and bond to each other to form metallic silver. One knocked-out electron only is unstable, so as time passes it's more and more likely to pick up a stray electron from elsewhere, which is why you need two photons in short order. Once you have a core of pure silver, one photon is enough to knock out another electron and allow another silver atom to bond with the existing pure silver. And since the silver halide crystals are conductive, you only need a hit anywhere on the crystal for the pure silver part to grow. Which incidentally means that the larger the silver halide crystal the quicker it will grow with a given amount of light. But of course, the resulting patch of silver will also be coarser. In other words, fast films have larger crystals, which means they're more sensitive, but also more grainy. But this means that the initial start where you first create a grain of pure silver needs rather more light than the subsequent growth of the pure silver patch. It needs two photons (one per silver atom) in quick succession or the grain doesn't create a silver core to build upon. And this is what pre-flashing basically does: creates the beginning of a pure silver core in each crystal so it becomes more sensitive to the subsequent image. Why not do it from the beginning, as part of the manufacture? My guess is that the state is not stable; the film becomes very sensitive to even the faintest of stray energy, and the silver core may well disappear over time as well. The shelf-life becomes quite short. I'm going to disagree i've seen pre flashing used succesfuly in the dark room. As photographic paper is "negative material", his arguement starts to fall apart. but then again l haven't tasted it under scientific conditions. l'm sure one of the readers here probably has, I'd be Interested to hear what experiance others have. Steve has put us right. All photographic materials are negative. A transparency is really a re-processed neg. I am wondering if the circumstances of using flashing in the darkroom and in the field differ so much as to make comparison difficult. Typically, we flash in the darkroom when we've already established that it needs to be done and we will always be able to refer to the previous un-flashed print. In the field, however good our technique, we are making an educated guess and we may not make an un-flashed duplicate. Looking at your example (Z0 > Z18) curve it seems evident that an ostensible extra zone of exposure at the very flat toe only adds about a quarter of a zone of actual density, when compared with the effect at Zone Five. Few of us expose and process to within a quarter of a stop, so even if the effect is real, it might easily pass unnoticed among other variables. I might have to try testing again, but only after the carpet-layers have been and gone. I was not aware of this post before, and definitively I am not an authority in the subject, but it happens that I use pre-flashing in the exact situation that Bruce Barnbaum refers, and in this situation alone: I do copper plate photogravure, where a positive is used to sensitize a pigmented gelatin to be adhered to the copper plate; the photogravure process tends to increase the contrast of the image, and therefore the positive should be created slightly "muddier" than normal. Given the scarcity of mid-tone ortho films today, I'm forced to use lith film sheets, which obviously tend to produce above average contrast, even when developed with diluted paper developer, the typical trick to decrease contrast. Pre-flashing is the only way I found to decrease somehow further the contrast. As I said, I'm not an expert, but Bruce Barnbaum's argument to use it for positives only makes pretty much sense to me. I very often use pre-exposure for negatives in very contrasty situations and it works well! I do zone II pre-exposure by means of a blank page of my smartphone with the lenses closely attached to it. I take care exposure time is longer than 1/30 if a second because of the smartphones LED frequency. On a bright sunny day people in the shadows that normally wouldn't appear in zone 0-1 are shifted to zone II-III and are visible. If you don't care about the shadows simpy place former zone I to II or III (means close 1 to 2 stops after pre-exposure)and you gain more potential for texture in the highlights. With pre-exposure of paper in the darkroom for the highlights I didn't succeed. But I only run one trial.